This is all studious me... Look at the little froggy on my computer, isn't it the cutest!! 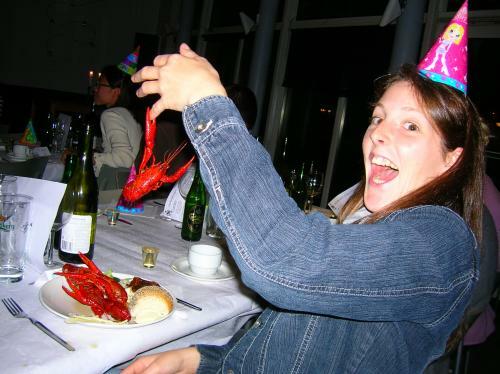 One of the many stupid pictures taken at the Crayfish party!! I've been invited to play a game, and I'm inviting you in turn. This is not the a-zombie-has-eaten-your-brain kind of game. Rather, it's a community for people from around the world. I don't know more yet, but please encourage me by joining! My name is Marie de Bellefeuille, I'm a twenty-one year old student from Québec, Canada. I am actually in my first year at Montreal University, completing a bachelor's degree in International Studies. I mostly like politics and law, but I also have to complete some economics lessons. I'm going to complete my second year in Lund, Sweden. After I'm done, I will try my hand at a Masters in International Journalism. I still have time to think about that, though. I might also turn towards politics or diplomacy.